This guy and his buddy have been hanging out in Harrier Meadow lately. Will be curious to see if we see much of them once the weather gets colder. Pretty cool woodpecker, with reddish head and bright yellow under the wings and tail. And a major ant-eater to boot. 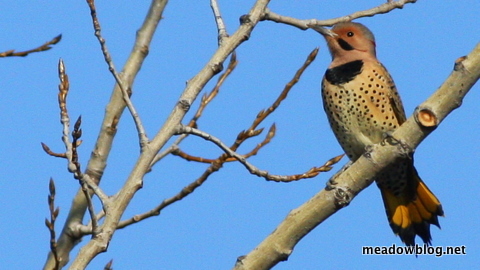 More on Northern Flickers here. Because of Security reasons at the Bergen County Utlitities Authority site, you must pre-register by Friday. Please e-mail Don Torino here or phone him at the number below as soon as possible if you plan to attend. Tuesday, December 15, 10 a.m. This free two-hour guided walk at Mehrhof Pond and the BCUA’s Mehrhof Woods starts at 10 a.m. at the BCUA entrance on Empire Boulevard in Moonachie. Because of limited parking and logistics, we will be carpooling from DeKorte Park in Lyndhurst at 9:30 a.m.
Mehrhof Pond is a great spot to watch wintering waterfowl, especially Ruddy Ducks. Because the Bergen County Utilities Authority property is generally closed to the public for security reasons, you must sign up for this walk no later than Dec. 4 and sign a standard liability waiver. No same-day registration will be accepted. To rsvp, contact Don Torino of the BCAS at greatauk4@aol.com or 201-636-4022. When it comes to photographing raptors, there's a lot to be said for staying in one's vehicle. 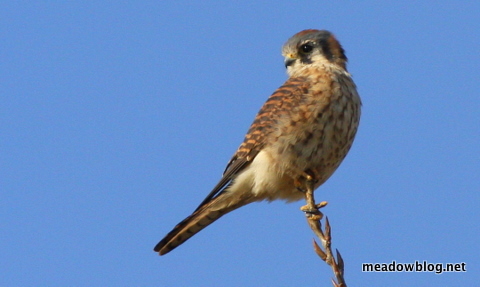 We were scouting in Harrier Meadow when this American Kestrel flew in and perched nearby. We've seen a lot of ducks out there as well, but they fly at the first sight of a human. It is clearly hunting season. 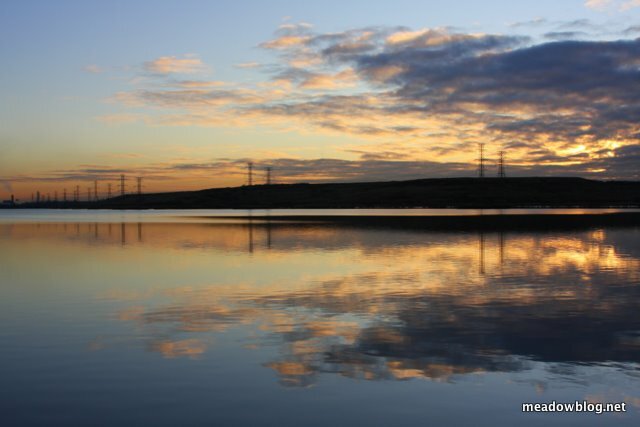 Carolyn Foote Edelmann — a poet, writer and photographer on nature, travel, history and art — posted a Thanksgiving item about the birds of the Meadowlands on her Packet Newspapers blog this morning. 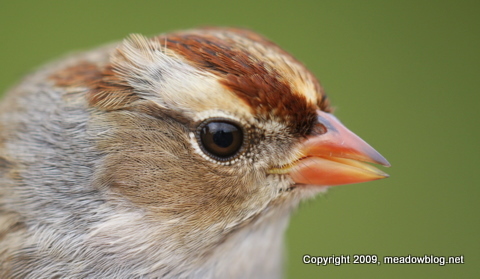 It cites the Meadowlands Commission’s bird banding list for this fall and begins…. of the MEADOWLANDS, no less! quote [the following] statistics, from the MEADOWLANDS. These are the birds of my Thanksgiving! Thanks, Carolyn, we couldn’t agree more. The link is here. 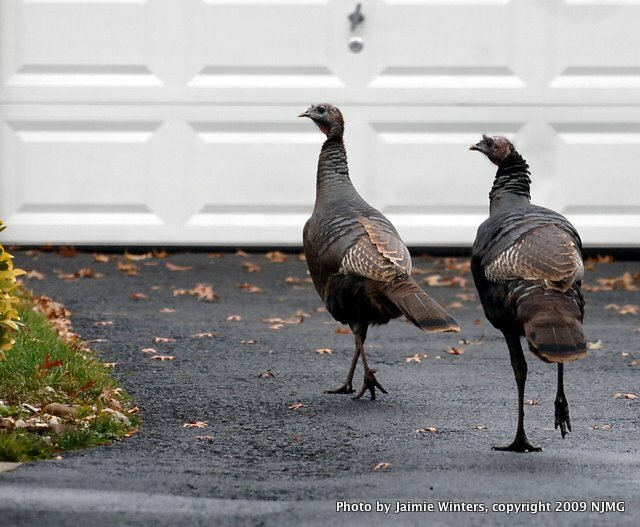 These two wild turkeys have been hanging out in Rutherford since this summer. A thank-you to Jaimie Winters, editor of The South Bergenite, for sharing this photo. More on Wild Turkeys here. The Meadowlands Commission's Jim Wright will speak on Winter Raptors, as well as a Brief History of the Meadowlands, in a slide show and talk at noon on Dec. 9 at New Jersey City University in Jersey City. 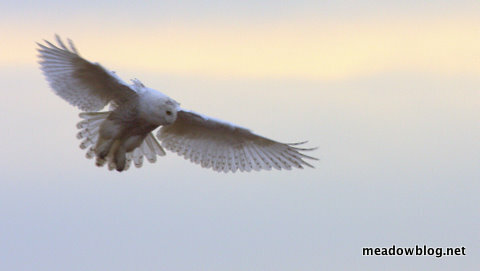 Wright, who maintains the Meadowlands Nature Blog for the commission and who does most of the photography for the blog, will discuss and show images of raptors seen in the Meadowlands last winter — including Snowy Owls (including the one above), Bald Eagles and Rough-legged Hawks. He'll also discuss the region's amazing environmental comeback, and show some great archival photos as well as new photos. “Winter Raptors of the Meadowlands,” free and open to the public, will be held at the New Jersey City University Center for Teaching and Learning, Vodra Hall, Room 143, 2039 Kennedy Boulevard in Jersey City. Reservations are required. For reservations or further information call Dr. Steven Haber, director of NJCU’s Center for Teaching and Learning, at 201-200-3282. We made a quick lunchtime stop at the Kearny Marsh yesterday to see what was around. 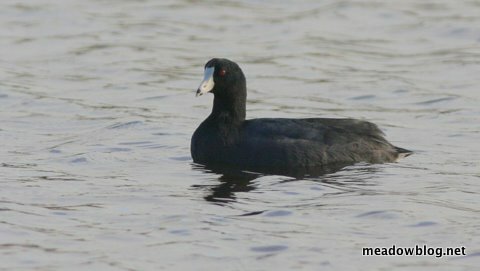 Parking in the northeast part of the Gunnell Oval (off Schuyler Avenue), we saw at least six American Coots and a distant Pied-billed Grebe amongst the Canada Geese. 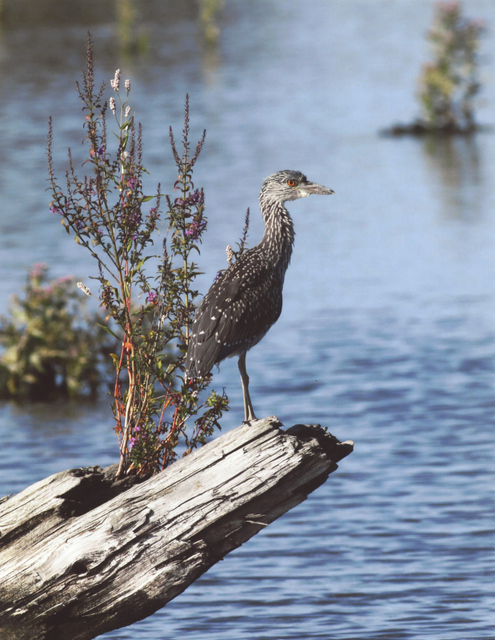 A stunning photo of an immature Yellow-Crowned Night Heron captured first prize in the New Jersey Meadowlands Commission’s 2009 Amateur Photo Contest, “The Meadowlands: 40 Years of Progress,” the NJMC announced today. The winning photo, and other contest entries, will be on display from Dec. 2 to Jan. 3 at the NJMC’s Flyway Gallery. Kearny resident Ronald Shields’ photo, “Out on a Limb" (above), placed first out of more than 100 entries received over the past three months. His image captures a young night heron surveying the Mill Creek Marsh in Secaucus from its perch on a tree branch jutting over the water. Laura Frazer of Montclair took second prize for “Reflections,” a beautiful photo of the gazebo and walkway reflected in a tidal impoundment at DeKorte Park in Lyndhurst. Ernie Fragetta of Lyndhurst won third prize for “Beautiful Lyndhurst Meadowlands,” which captures a majestic great egret flying across the marshes. The three winners will receive prizes of $300, $150 and $75. Click "Continue reading…" to see the other two winning photos and for more information on the contest.